An ECG records the electrical activity of the heart. The heart produces tiny electrical impulses which spread through the heart muscle to make the heart contract. These impulses can be detected by the ECG machine. You may have an ECG to help find the cause of symptoms such as the feeling of a ‘thumping heart’ (palpitations) or chest pain. Sometimes it is done as part of routine tests – for example, before you have an operation. Small metal electrodes are stuck on to your arms, legs and chest. Wires from the electrodes are connected to the electrocardiogram (ECG) machine. The machine detects and amplifies the electrical impulses that occur at each heartbeat and records them on to a paper or computer. A few heartbeats are recorded from different sets of electrodes. The test takes about five minutes to do. 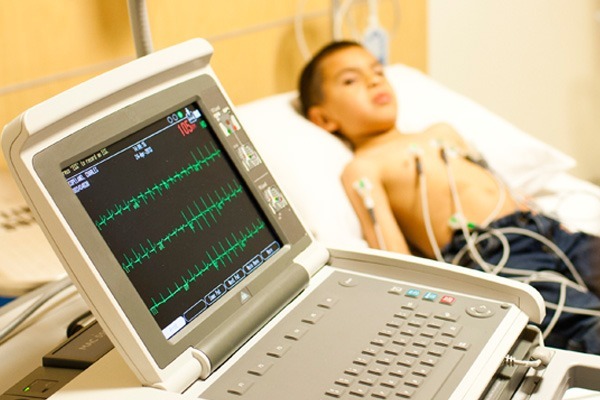 What does an electrocardiogram (ECG) show? Abnormal heart rhythms. If the heart rate is very fast, very slow, or irregular. There are various types of irregular heart rhythm with characteristic ECG patterns. A heart attack (myocardial infarction) and if it was recent or some time ago. A heart attack causes damage to heart muscle and it heals with scar tissue. These can be detected by abnormal ECG patterns.